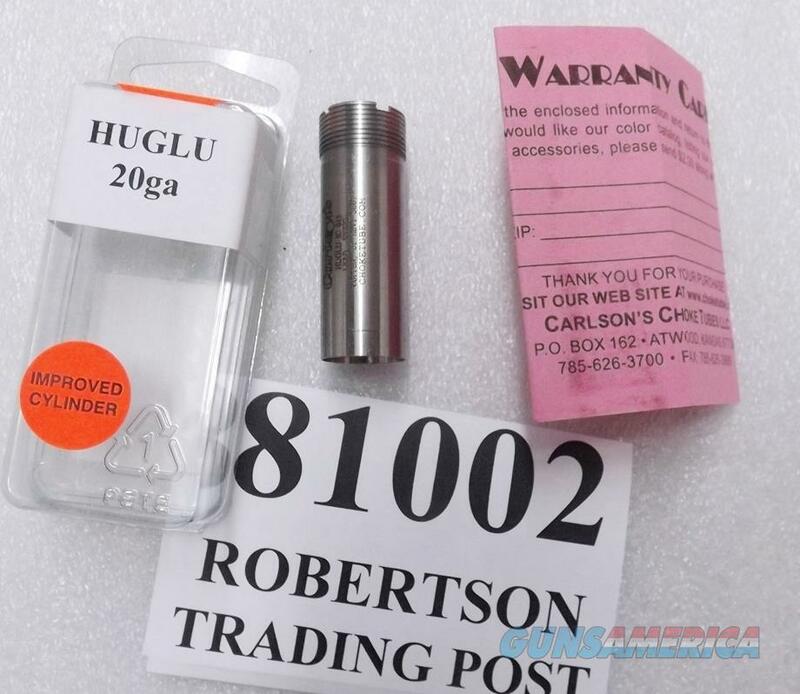 Carlsons Huglu thread 20 gauge .615 Improved Cylinder Stainless Choke Tube 81002 All CZ Hatsan Mossberg International Silver / Onyx Reserve Buy 3 Ships Free! Description: This listing is for ONE choke tube. Buy 3 ships free: Buy 3, or any 3 of our non gun non ammo items and shipping is Free for the entire order, lower 48. Here are choke tubes that will fit any of the following shotguns chambered in 20 gauge, with choke tube threads at their muzzle end: BSA Silver Eagle Over and Under below serial # 201836; Century Arms/Kahn Centurion & Arthemis Over and Under Shotguns; CZ USA Shotguns; DeHaan Side by Side and Over Under Shotguns; Gazelle model SPD 310 Over Under Shotgun; Hatsan Pump, Auto, and Over Under Shotguns with threads at the muzzle; Huglu Over and Under or Side by Side Shotguns; Mossberg International Silver Reserve side by side or over / under; Mossberg International Onyx Reserve side by side or over / under; and Verona model 501 over / under. These tubes will not fit any other shotguns to our knowledge. Manufacturer and warrantor is Carlson’s Choke Tubes LLC of Atwood Kansas. Construction is entirely stainless steel. Muzzle end diameter is .615, Improved Cylinder choke tubes, for use with lead shot, steel shot, hevi or bismuth type shot, and buckshot; and tubes are so marked. They are also compatible with 20 gauge rifled slugs. Each tube comes in its factory package with labeling, with enclosed warning and warranty registration card. Replacement pricing for similar tubes often runs upwards of $30 apiece or more. We’re offering the tubes in the photos, however, or their identical mates, each	for only	$ 21.00.